A US soldier shot on the Baghdad University campus has died from his wounds, US military officials have confirmed. The US Central Command said the soldier - a civil affairs officer from the First Armoured Division - died at a field hospital where he was taken after the shooting. The soldier was guarding the campus in the centre of the city when he was shot in the head, a US military spokeswoman said. Witnesses said a lone gunman brandishing a pistol escaped from the scene of the shooting - a campus cafeteria - into the panicking crowd. The BBC's Peter Greste in Baghdad said he had heard a single shot and came out of a nearby building to see the soldier's colleague keeping students back and calling for assistance. Twenty-seven American and six British soldiers have been killed in Iraq since US President George W Bush declared major hostilities over on 1 May. US troops maintain tight security at the university, searching people and vehicles before entering the grounds. Most students appeared stunned by the shooting. But our correspondent says there is some animosity towards the occupying forces and as the Americans drove off with the injured soldier, some shouted Allahu Akbar - God is Great. 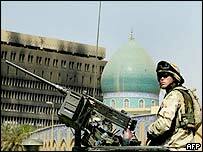 The shooting of the soldier is the latest in a series of ambushes, attacks and killings that have continued against US-led troops and their "collaborators" since the fall of Saddam Hussein's regime. On Saturday, at least seven Iraqis were killed and more than 50 were injured in an explosion near a police station in the town of Ramadi 100 kilometres (60 miles) west of Baghdad. The victims were new police recruits who had just finished training with US troops. A British journalist was shot dead in the capital on Saturday outside the Iraqi National Museum - where a sniper had shot dead a US soldier guarding the building a few days earlier. The attacks are blamed on pockets of resistance loyal to the former president. A recorded message, said to be the voice of Saddam Hussein, was broadcast on Arabic satellite television channel al-Jazeera on Friday. The voice praised the "jihad cells made up of Iraqi male and female fighters" that had been formed throughout Iraq to fight US-led coalition forces. The US has launched a series of military operations to hunt out the fighters since May. The latest, Operation Sidewinder, ended on Sunday after a week in which troops in central Iraq arrested 282 people and seized a variety of weapons including 96 AK-47 rifles, three heavy machine guns, 217 rocket-propelled grenades and 33 grenades. US Central Command says its troops will continue to conduct active patrols. "It was meant to be a safe area"